I love setting out on long, aimless bike rides with my camera. 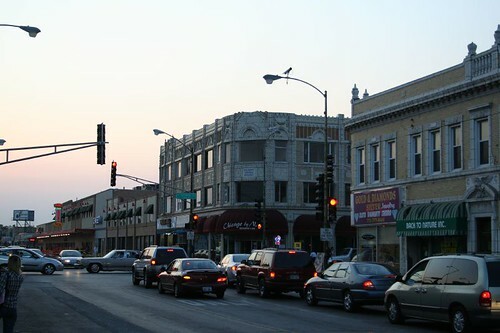 The thrill of discovery awaits, particularly as I venture further and further from the familiar areas around Rogers Park. I went on such a ride this afternoon, voyaging miles westward along Foster, then eventually veering south on Central, where I found a bevy of my beloved geometric glass block. The sun was almost down, and I had accepted that the trip was nearly over… but something kept pulling me southward along Central Avenue — perhaps the promise of “just one more”. And so it was that I made my prize discovery of the day: the intersection of Central and Belmont. The light was poor, and I was too impatient to set up really good shots, but I have to share it anyway. What an amazing intersection! It is anchored by excellent buildings on all four corners. Southwest, the Boolookas Building. Boolookas! I think my parents used to threaten to smack me on the boolookas if I misbehaved as a child. 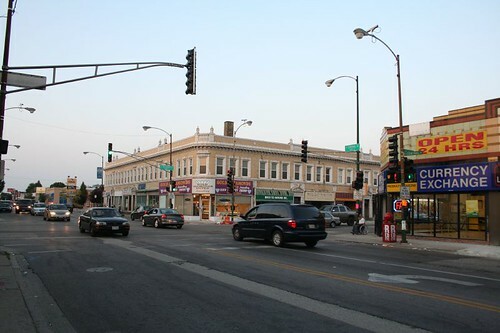 The intersection is the heart of (no surprise) the Belmont Central neighborhood. Both streets are densely developed in both directions for many blocks, and the area’s Polish heritage remains visible today. I am looking forward to going back when the sun is above the horizon. I often bike ride around this area. It is a great place to “discover” something new. I love it! What an amazing collection of buildings! Welcome to my old neighborhood. 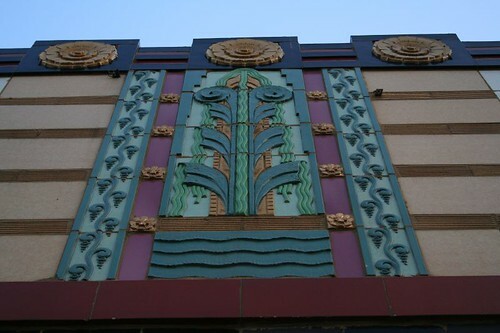 There used to be a nice looking Art Deco theater, the Will Rogers. 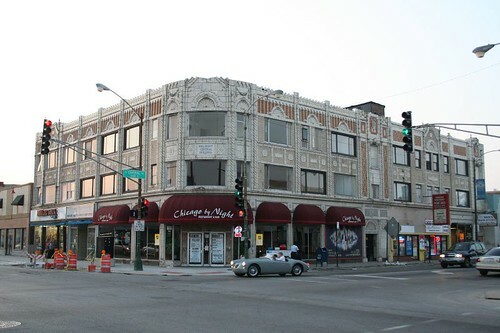 Also, the biggest store was a Goldblatt's.Good to see you don't just cover the north side lakefront as some always do when they talk of "the city". It is a lot more that that!! Back in the 60's, 70's and early 80's I loved to shop there. The northwest corner of Belmont & Central had a religious card & gift shop called Jubilee Card & Gifts. The southeast corner had a Greek diner type restaurant. A huge Polk Brothers was on Central. Penney's, Goldblatts & Walgreens were on Belmont along with The Will Rogers theatre and a large beauty school. Bridal shops, Fannie Mae Candies & Tailored Girl (a high end boutique for its time)were dispersed along Belmont as well. 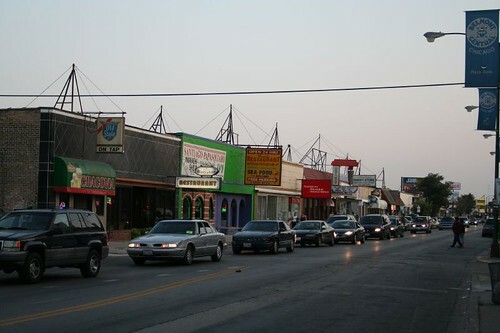 A huge craft & hobby shop called Blackstone was located on Belmont just east of Central. It was a great place to shop. Too bad I didn't pay more attention to the architecture when I lived there and had the chance. Blackstone was on the south side of Belmont Ave. all the way east just West of Long street. Across was Metro, also a craft store. Next to it on the North side was a place you could get a fresh chicken butchered. And just west of that was Pilot Paint and hobby. Have great memories of all those places. On the south side of Belmont ave. about two blocks East of Central Ave. there was a huge two level music instrument store that was there in through the late 60’s through the 80’s. I think it finally went out of business late 80’s or early 90’s. Anyone remember the name of that place? I randomly came across this post…and it was driving me nuts, Rob. I bought my first bass guitar amp there sometime shortly before it closed down, and I couldn’t remember it either. I searched the internet like a hawk to find a trace of it, and it was hard but I did find it. The musical instrument store was named Biasco. That was a cool joint, and it was the type of place you just knew you were going to get good service. I will never forget shopping at Tailored Girl in the late 70’s as a high schooler. To this day (2016) I’ve not found one boutique to fit my personal taste the way that store did. 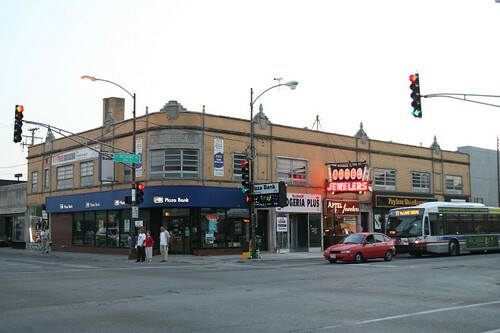 In the 60s just south of Belmont on the east side of Central was a currency exchange where you would go up to a window and a bald guy with a graying moustache would take your payment to Commonwealth Edison (for which you got free light bulbs) or write you out a money order. Next door was a sporting goods store, mostly stocked with fishing stuff, where a dragonfly buzzed by and terrified me as a 4 year old. Across the street was a Chop Suey restaraunt. You don’t see many of those anymore. Farther south on Central were 2 bowling alleys: Manor and Stafford Bowls. Farther still (near Fullerton) was Polk Brothers. Anyone remember the giant chair in their parking lot? I couldn’t find anything about this on the web. Around Fullerton and Central were The Diplomat (a fancy restaurant, not like Jerry’s on Belmont where we got cheap burgers), Bit ‘o Tropics (a tropical fish store) and Wimpy’s Burgers, across from Hanson Park. There was a bench across the street where you’d wait for the northbound Central Avenue bus. At one point in the 1970s it was painted to read: “YOUR AD HERE”, but someone had changed the “D” to an “SS”. Seems like I still live in that old neighborhood in my mind, now 50 years later and 2000 miles removed. It’s Christmas Day 2016, Happy Holidays to everyone. I wish I could see what type of holiday lights and decorations are set up in the windows at Metro….just like I did back in the 70’s and 80’s. I remember Manor bowl. Four of us in eighth grade from Peter Reinberg School were in a league over there in 72 or 73. I still have a few vague pictures in my head of it. I think I was in Stafford bowl once or twice. I just remember the doors were like really industrial and heavy. I also have a memory of a sports store across from Manor (on the East side of the street) somewhere in there but only went in there once or twice. I remember just really wanting one of those great hockey jerseys, sticks, gloves….oh just give one of everything!! Being in 7th and 8th grade I didn’t have the money for it but that didn’t stop us from playing hockey over at Chopin Park. I still can remember one really cold walk home after playing ice hockey after school straight down Cornelia ( I lived over by Wright College) to get home for dinner. 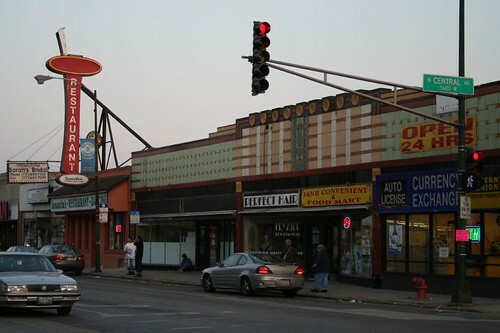 Not too many of the original places left from my youth (Metro, Edwards Liquors which is now Cardinal is still there) but I still miss the place.